Metro hopes a new cellphone-based ticketing option set to launch next year will be the latest step to make the transit agency more like an airline. Metro officials provided new details of the project. WASHINGTON — Metro hopes a new cellphone-based ticketing option set to launch next year will be the latest step to make the transit agency more like an airline. 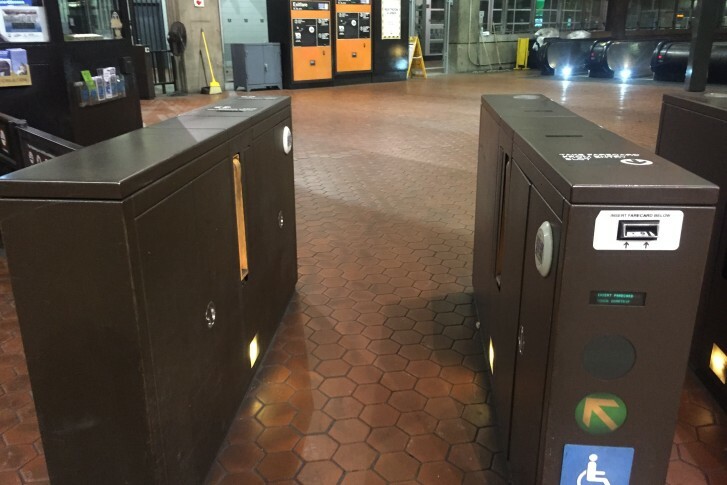 However, a presentation to the Metro Board this week clarified that the change will not mean you can just tap a credit card on fare gates like some other cities are planning. Greg Garback, who is overseeing the program for Metro, said the plan is not an “open payment” model, but instead would require a “virtual SmarTrip” in a cellphone’s mobile wallet. The payment at a fare gate would aim to be as fast or faster as tapping a SmarTrip card today, in the hopes of avoiding lines. Riders could load money into the virtual SmarTrip account via a credit or debit card using a Metro app, similar to the online reload system available today. The money would show up more quickly though, since the phone would have a direct connection to the account. Today, it can take several days for a SmarTrip card to register an online transaction because information from the database is not immediately uploaded to the fare gates and bus fare boxes that must communicate the additional value to the cards. Metro’s goal, Garback said, is to get to where airlines are, including sleeker fare vending machines for riders that continue to use SmarTrip cards and exit-fare machines that accept credit or debit. “[We’re] looking for things that would be more ATM-like, more airport-like,” Garback said. The machines are expected to have large digital touch screens like an ATM with options for multiple languages. Metro is also in the process of purchasing the next round of new rail cars expected to begin arriving in about five years, and is about to award a contract for the new Potomac Yard Station in Alexandria on the Blue and Yellow Lines. Fare payment capability in the Apple iOS and Android apps may not launch at the same time, and may vary based on cellphone provider. “There’s an app for that, we’re very excited about this initiative,” Garback said. Still, the announcement this week that an app would be ready by the end of the year, with payments through it set to launch in 2019, surprised many local transit agencies that also use SmarTrip cards, Virginia Metro Board Member Jim Corcoran said. Riders with phones that have the app and proper technology will be able to use the mobile payment system anywhere SmarTrip is accepted when the system is fully rolled out, Garback said. The cards first launched in 1999. Other moves toward more airport-like features in the Metro system remain in place, including music playing over the speakers in selected stations and recently automated announcements that are easier to understand than in the past. The music has prompted complaints from some riders. Metro’s previous attempt at mobile fare payments was canceled in 2016. That effort would have included the use of credit cards but likely ended the use of SmarTrip cards. At Thursday’s Metro Board Committee meetings, it emerged that Metro and Accenture, the company that had the 2014 contract for the unsuccessful pilot, could end up taking a dispute over that project to court. The details of the legal fight were not clear, but following through on the $25 million design and testing project would have required spending about $150 million more. The limited pilot had not been successful given restrictions and some reluctance from riders to pay with their phones at the time. Today’s plans are “totally different” Wiedefeld said, because they do not require scrapping existing SmarTrips. “We’re focusing on building off the existing system, the market’s changed,” Wiedefeld said. Metro now plans to replace 25-year-old fare gates at all stations within about two years. Those gates would accept both regular SmarTrip cards and the virtual ones on phones that come with near-field communication technology built in. Bus fare boxes also need significant upgrades, which Garback described as a “Band-Aid” until a full-scale replacement is possible. Local bus systems that rely on Metro to coordinate the SmarTrip program have complained the changes are not coming quickly enough. Corcoran stressed to Metro staff that close coordination with local agencies is critical.